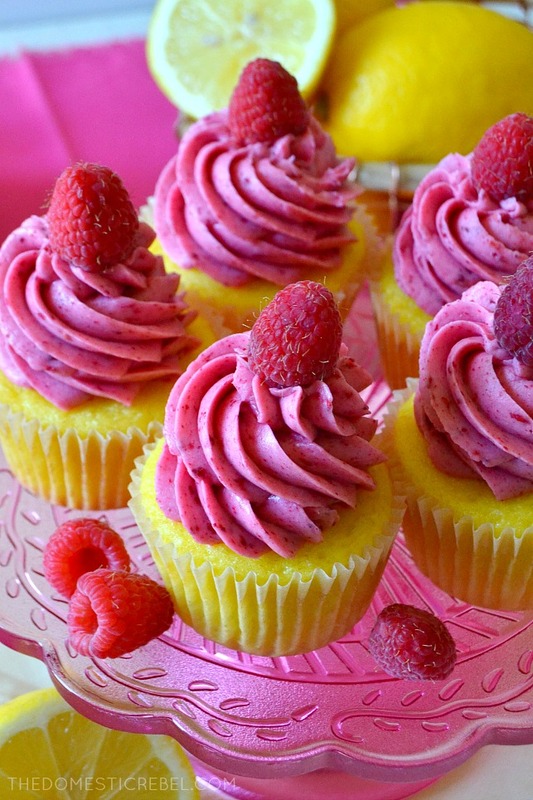 Bright, juicy raspberries and zesty lemon are the stars of these Raspberry Lemonade Cupcakes! So fresh, fabulous, and easy! So a couple of weeks ago, I was in a serious rut. Normally, I cannot shut up the amount of ideas I have swirling in my head. I am bombarded day after day, sometimes minute after minute of recipe ideas that don’t stop swirling around like a tornado until I make them. Usually this is not a problem, unless I’m broke, or tired, or trying to do something else other than be hyper-focused on Reese’s peanut butter cups. But I was at a complete stoplight a couple weeks back. I had NO idea what to make, and it was torture. I mean, I am notorious for coming up with wacky-yet-delicious concoctions on the regular and suddenly my creativity was dry as a bone. What gives? Thankfully, I have you guys as my resourceful friends to give me ideas, and I received an overwhelming response for raspberry-flavored goodies on Instagram. I happen to adore raspberries and think they’re perfect for spring and summer, so I was game to create something equally delicious and easy featuring this delectable little fruit. 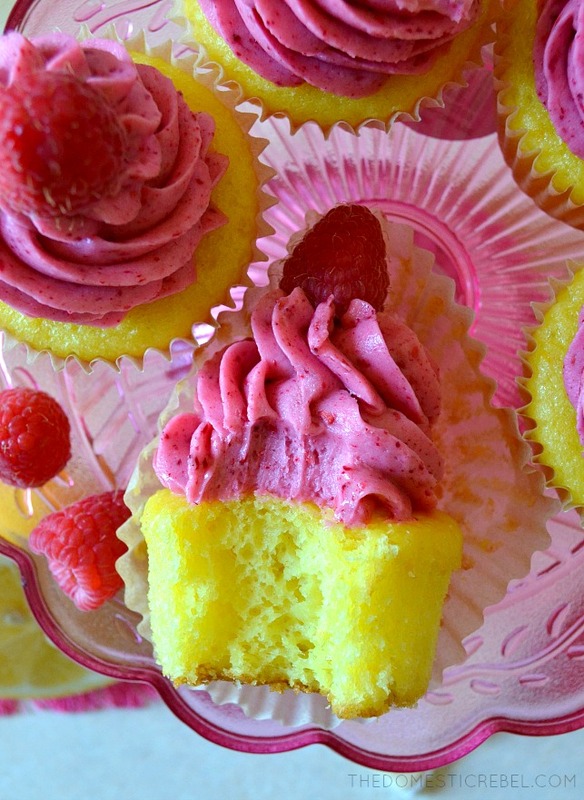 Enter: these Raspberry Lemonade Cupcakes! 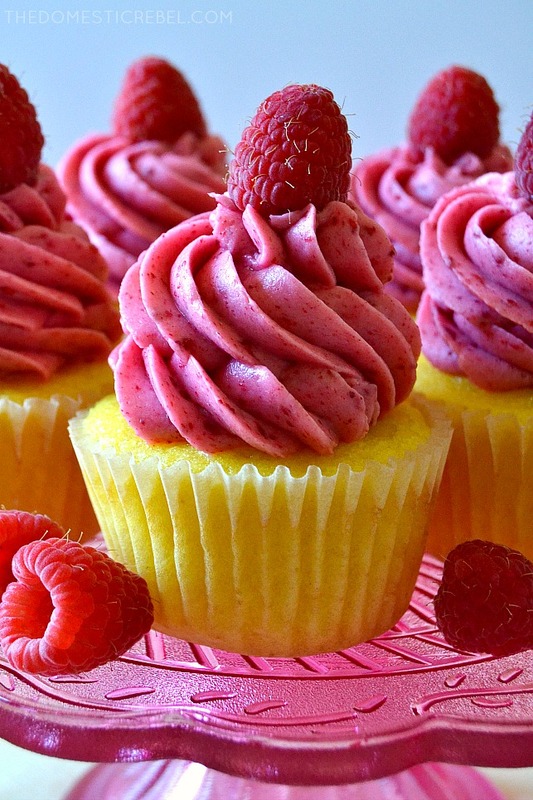 A moist, tender lemon-flavored cupcake topped with a juicy, super flavorful raspberry frosting. These are seriously incredible – the raspberry frosting is KILLER! My secret for a true, intense, REAL raspberry frosting comes from my fave secret ingredient: freeze-dried raspberries! These are real raspberries that have been – you guessed it – freeze-dried for a wonderful crunch and a great on-the-go snack… but also as a marvelous, amply-flavored ingredient for flavoring cakes or frostings. 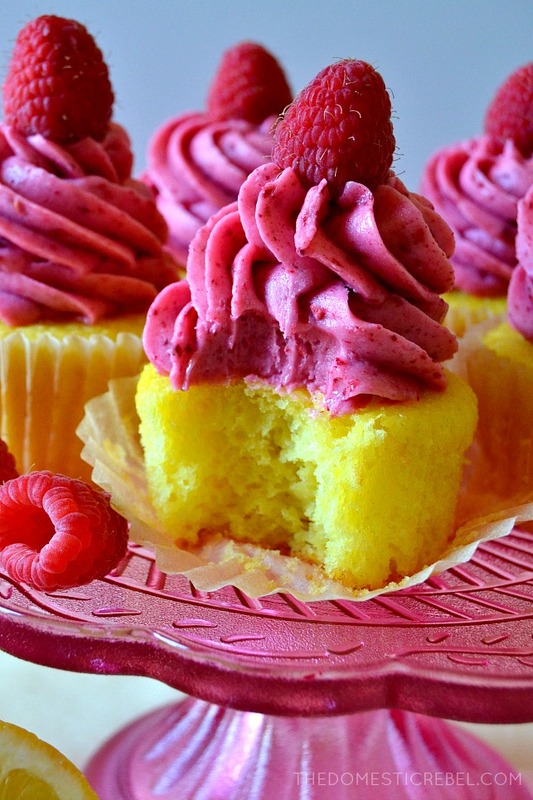 You simply pulverize the freeze-dried raspberries until they are a finely ground powder, then mix them into the frosting for a gorgeously colored and flavored frosting! Combined with the bright and zesty lemon cake, this is a totally fabulous cupcake flavor combo! 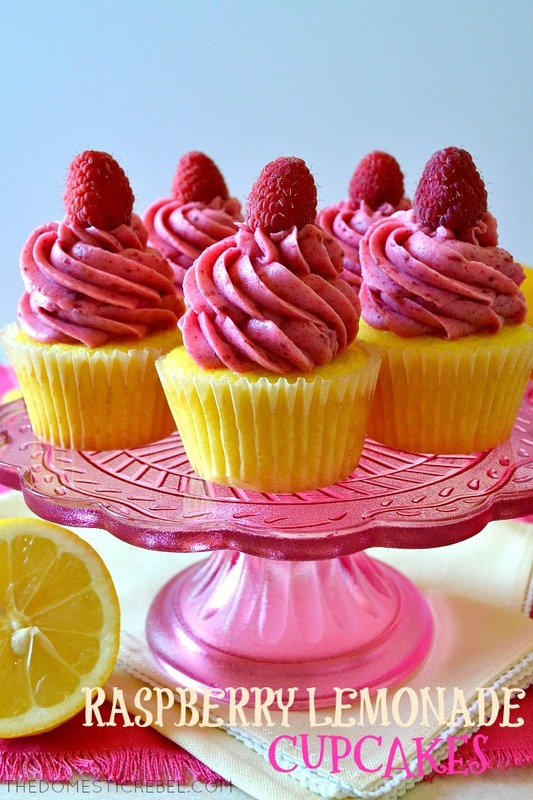 These Raspberry Lemonade Cupcakes are super flavorful, bright and zesty with fresh flavor! Combine the cake mix, buttermilk, lemon juice, lemon zest, oil, and eggs with an electric mixer until combined, 2 minutes. Portion the batter evenly among the muffin cups, filling about ¾ full. Bake for 16-20 minutes or until a toothpick inserted near the center comes out clean or with moist crumbs. Cool completely. For the frosting: Combine the butter and vanilla extract together in the bowl of a stand mixer and beat until fluffy, 2 minutes. Add in the freeze-dried raspberry powder and beat slow until incorporated. Gradually add in the confectioners' sugar, one cup at a time, alternating with the heavy cream until frosting is light and fluffy. Pipe or spread the frosting onto the cooled cupcakes. Garnish with a fresh raspberry, if desired. Fresh, easy, flavorful and fabulous! You’ll love these cupcakes! Disclaimer: this post contains Amazon affiliate links. If you make a purchase using my link, I will receive a small commission at no cost to you. Thank you for keeping my blog alive! These are beautiful! I love your Lemon Bar Cupcakes. Can you tell me which brand of freeze dried raspberries you use for this recipe? What about koolaid powder in the frosting in place of the dried raspberries, would that work too? Hi Rita, I am sure the Koolaid powder would work! You can find freeze-dried raspberries at most grocery stores, as well as Trader Joe’s and Target! I usually grab TJ’s or Target brand because they’re inexpensive and in 1-ounce bags. Hi! Would this frosting work well on a cake piping it with rosettes? I would test it on a few rosettes first and if it is too soft, add some more powdered sugar. would this work as well with raspberry jello mix?? or would it make it extremely sweet?